Sometimes bands are not particularly original, but they are anachronistic enough to actually sound original at their particular time and place. This was the case with The Hives, and fortunately they did their Swedish Ramones for the 21st century act so well that the album ends up being really enjoyable. The bursts of angry sounding and fun filled short tracks that compose this album are really memorable stuff. Each track depends on a single hook, and one that often seems to be repeated on several tracks, this gives you an almost instant familiarity with the tracks, which makes it very easy to like, if you are open to a bit of noise in your life. This album really lives on those musical hooks, the lyrics are often semi-literate, and we are constantly reminded of the fact that they are not writing in their first-language, but this just ends up adding to the charm of the whole thing. A great fun, fast and furious album which doesn't take itself seriously, and is, therefore, unpretentious. 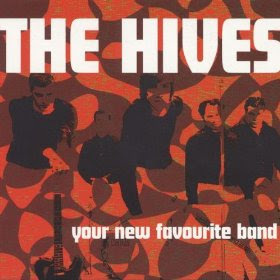 Your New Favourite Band is a collection by The Hives, featuring tracks from their first two albums and the A.K.A. I-D-I-O-T EP. The decision to release such a compilation after only two albums was made with the intention of achieving mainstream success in the UK and the U.S.